Angling Legend Paul Young at GAC! Fish of the Month June Entry - Durness Pollack! Fish of the Month June Entry - Shannon Salmon! Fish of the Month June Entry - River Pike! Fish of the Month June Entry - Carp on the Fly! Fish of the Month June Entry - Calder Brownie! Fish of the Month June Entry - Tay Salmon! Fish of the Month June Entry - Butterstone Brown! Fish of the Month June Entry - Scottish Chub! Fish of the Month June Entry - Cumbernauld Tench! Fish of the Month June Entry - Castle Hill Trout! Fish of the Month June Entry - Lewis Bownie! Fish of the Month June Entry - Glengavel Giant! Fish of the Month June Entry - Carron Trout! Fish of the Month June Entry - Whitemoor Double! Fish of the Month June Entry - Quick Salmon! Pure Fishing New Product Showcase at GAC! Fish of the Month June Entry - First Fish! Fish of the Month June Entry - Cape Verde Wahoo! Fish of the Month June Entry - Pop-Up Pike! Fish of the Month June Entry - Sandwich Carp! Fish of the Month June Entry - Hillend Brownie! Fish of the Month June Entry - Thames Bass! Latest Hardy and Greys Gear at GAC - Part 2! Fish of the Month June Entry - Harelaw Pike! Fish of the Month June Entry - Livi Carp! Fish of the Month June Entry - Sheelin Brownies! Latest Hardy and Greys Gear at GAC! Fish of the Month June Entry - Loch Awe Pike! Fish of the Month June Entry - Faskally Trout! Fish of the Month June Entry - Kiwi Rainbow! Focus on Scott rods and SA Lines at GAC! Fish of the Month June Entry - Surface Carp! Fish of the Month June Entry - Big Torsk! Fish of the Month June Entry - Townparks Catfish! Fish of the Month June Entry - Eglinton Pike! Fish of the Month June Entry - First on a Fly! Fish of the Month June Entry - Big Smooth Hound! New Wychwood Charles Jardine Fly Lines! Fish of the Month June Entry - Shore Tope! Fish of the Month June Entry - Corrib Trout! Fish of the Month June Entry - Boyne Salmon! 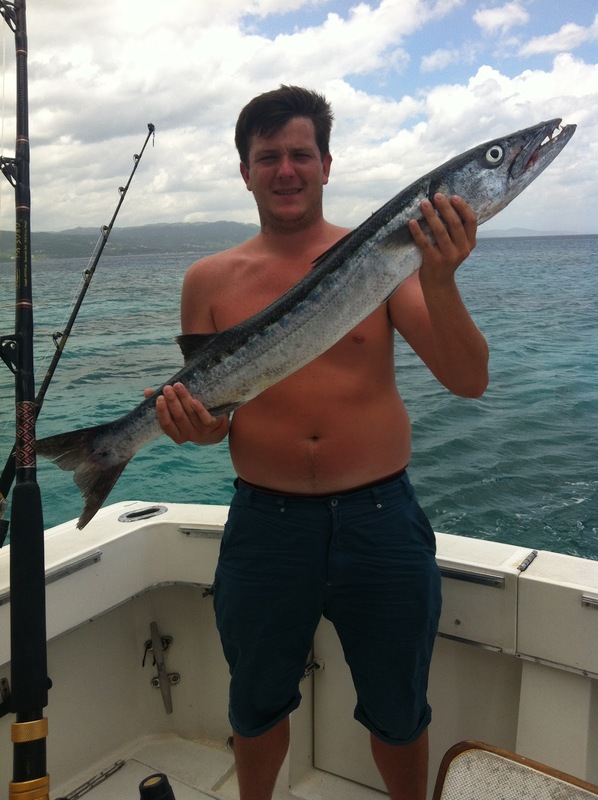 Fish of the Month June Entry - Jamaican Barracuda! 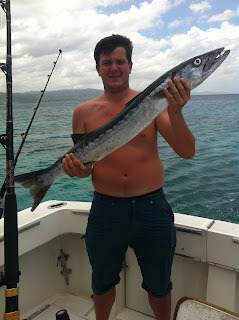 Ross Light caught this 18lb Barracuda 8 miles out from Montego Bay, Jamaica. The fish took a lure and put up an awesome fight before being boated! You can vote for this picture to win on Facebook by selecting it in the June 2012 gallery HERE and hitting the 'Like' button!